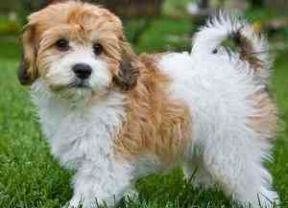 Thinking of buying or adopting a Cavalier King Charles Spaniel? 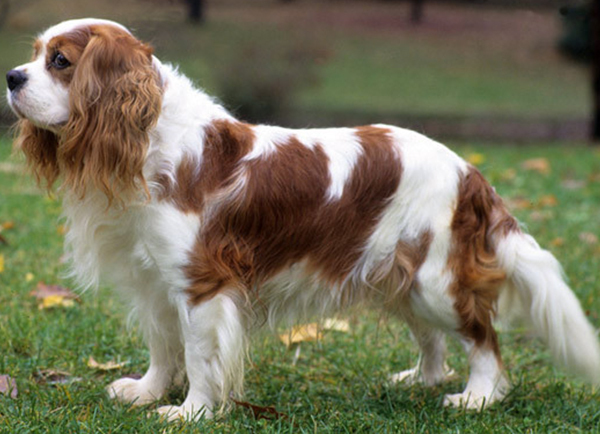 Blenheim – rich chestnut markings on pearl white coat. 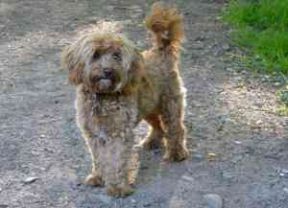 The ears are chestnut in colour, evenly divided on the head and surrounding both eyes with a white blaze between the eyes and ears and a characteristic lozenge mark or “Blenheim spot” on the crown of the head. 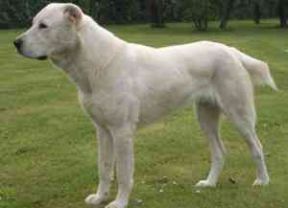 Tricolour – jet black markings on pearly white coat, broken up with tan markings over the eyes, cheeks, inside the ears, inside legs and on the underside of the tail. The ears are black in colour and the black evenly divided on the head and surrounding both eyes with a characteristic spot on the centre of the head. Black and tan – jet black with bright tan markings over the eyes, cheeks, inside of the ears, chest, legs and on the underside of the tail. It has a sweet, gentle, melting expression with large round eyes of dark brown colour accentuated by dark eye rims. It features long, leather ears set high on the head and wide at the end. The skull has a moderate stop, tapered muzzle and a black nose. The jaws and teeth form a perfect, regular and complete scissors bite. It has a level topline with moderately deep chest, no tucked-up appearance and a well-set on tail carried slightly above the level of the back. The double coat is of moderate length, silky and curl-free with featherings on the ears, chest, legs and tail. A typical size Cavalier King Charles can weigh between 5.9 - 8.2 kg and stand between 30 – 33 cm at withers. The Cavalier King Charles Spaniel is a direct descendant of the small Toy Spaniel that was popular among the nobility during the 16th to the 18th centuries as lap dogs and foot warmers. King Charles II was often seen with two or three Toy Spaniels with him. Historical accounts tell us that they were also used for attracting fleas from their owner’s bodies sparing them from diseases. There were years where the popularity of the breed among the royalty was overtaken by the Pug, particularly during the reign of William III. 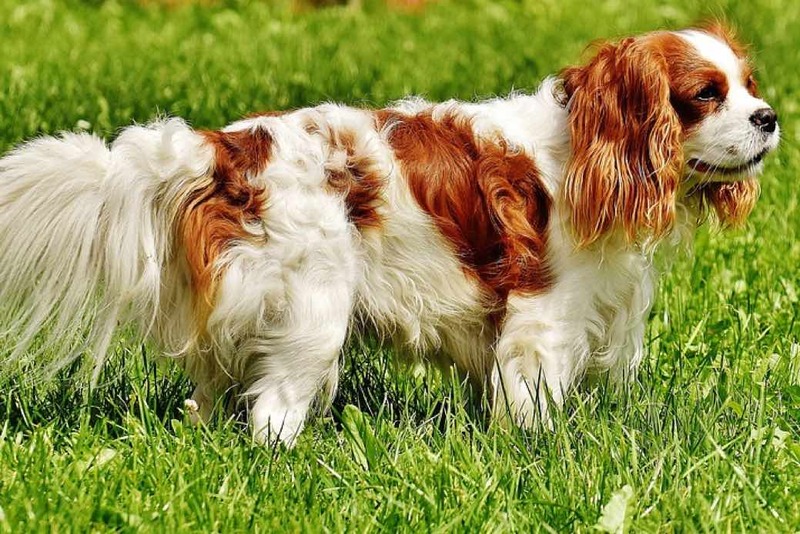 In the early part of the 18th century, a special strain of red and white Toy Spaniel became popular through the efforts of the Duke of Marlborough who bred them at the Blenheim Palace. These strains are what we know today as the Blenheim colour type. A Toy Spaniel club was formed with the advent of dog shows and with this came the first breed standard. 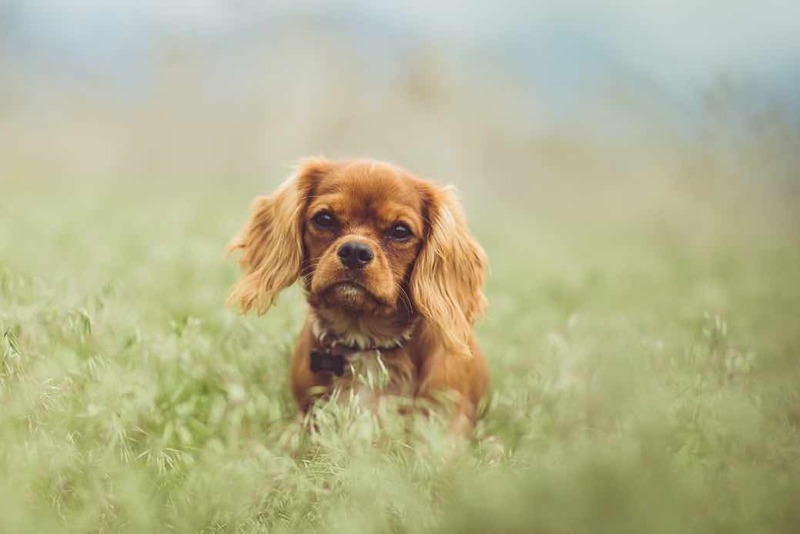 The Kennel Club officially wanted to retain the name “Toy Spaniel” but King Edward VII wanted to retain the “royalty” of the breed and so “King Charles Spaniel” was adopted as the official name. In 1926, American Rowell Eldridge came to England looking for old-type Blenheim spaniels similar to what Charles II had on his portraits but failed to find one so he offered £25 at Crufts for whoever could produce a breed similar to that of Charles II’s era – long face, no stop with a flat skull and not domed with the unique spot on the centre of the head. He died without seeing the fruit of his efforts. 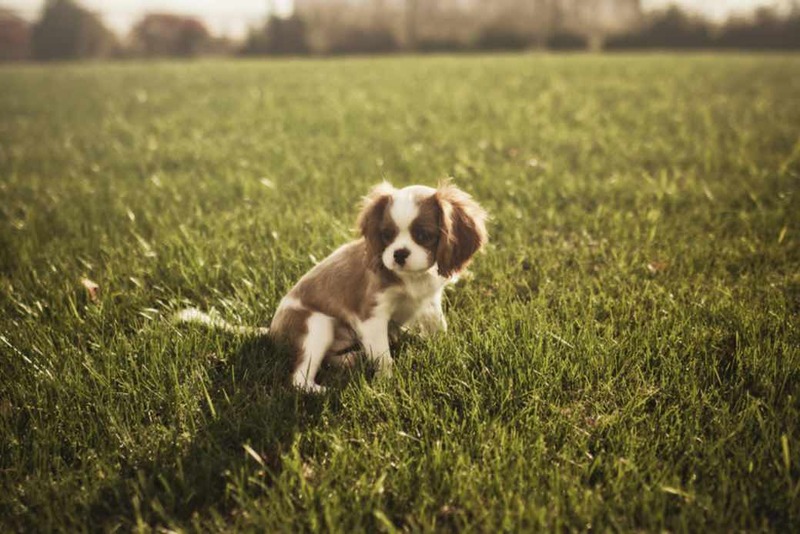 Two years later, the Cavalier club was formed by breeders who continued his passion and thus the Cavalier King Charles Spaniel breed was born. After World War II, only 6 Cavaliers survived and all modern-day Cavaliers can be traced to those original six dogs. The Cavalier was officially registered by the Kennel Club as a separate breed in 1945. Today, they are the quintessential lapdog. 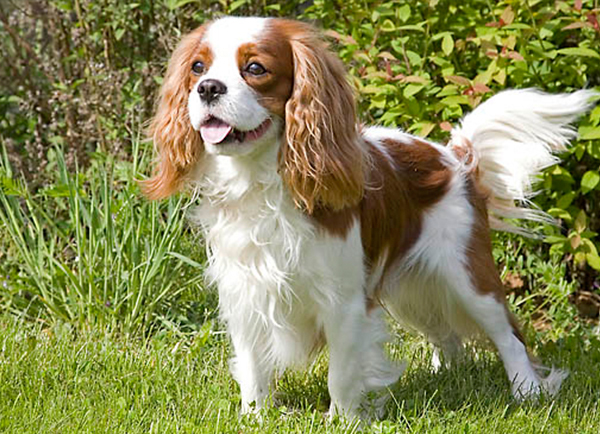 Sweet, gentle, and playful, the Cavalier King Charles Spaniel is known as the “love sponge” of dogs. It requires a lot of human attention and will not do well if left alone for long periods of time. Being such a friendly dog, it is not suitable as a guard dog. It is highly affectionate, playful, and extremely patient and makes excellent therapy dog for the elderly. The Cavalier King Charles Spaniel has an average intelligence but it is not difficult to train. It ranks 44th in Stanley Coren’s “The Intelligence of Dogs” in terms of working or obedience rating. It does well in obedience and agility training and conformation shows. The Cavalier’s coat requires weekly grooming. Brushing with a stiff bristle brush once a week will do, with no mandatory trimming required. However, some owners prefer to trim the long feathers on the legs and feet, which would otherwise quickly gather dirt when walking or playing outside of the house. The Cavalier King Charles Spaniel has the tendency to suffer mitral insufficiency (MI) at some point in its life. MI is a heart disorder where the mitral valve does not close properly during systole, causing abnormal backflow of blood into the left atrium. This abnormality causes valvular heart disease and is the most common cause of death for this wonderful breed. Other health concerns include luxating patella, cataracts, retinal dysplasia, hip dysplasia and ear problems. The typical lifespan of the Cavalier is 9 – 14 years. The Cavalier is strictly an indoor dog but it still needs daily exercise. It will be happy either curled up on the couch or on a daily short walk. It is easily adaptable to any living environment, be it in an apartment in the city, in a suburban home with or without a yard, or in a rural house in a country setting. The Cavalier King Charles Spaniel is a very sociable animal and is generally friendly with other dogs and animals. It is generally friendly and quickly bonds with other pet animals in the house, both big or small. However, it is generally advised to socialise the breed early with other animals such as hamsters, gerbils, guinea pigs, rabbits, and similar pets as its strong hunting instinct may turn over. It is also extremely patient and excellent with children regardless of age. Ruby Kc Cavalier King Charles .stud.